Jean-Remy Makana completed his PhD in Forestry at the University of Toronto, before starting his work with the Wildlife Conservation Society as a Forest Scientist in the D.R. Congo. He was the Director of the WCS-DRC Forestry project before he being charged of the Alternative Activities and Livelihoods in the Ituri Forest Conservation Project. 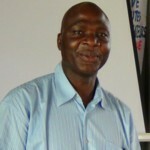 His work on the ecology and management of African mahoganies is one of the rare research programs in the field of forestry in the Congo. Dr. Makana is also a member of a network of scientists, under ForestGEO of the Smithsonian Tropical Research Institute (STRI), seeking to elucidate issues on the ecology of tropical forests such as how they maintain incredible levels of plant diversity and their role in global climate change through carbon sequestration. He is also working with logging companies and local communities to mainstream biodiversity conservation in managed forest landscapes objectives.